This monumental book offers a comprehensive history and analysis of Republican political life during the Spanish Civil War. 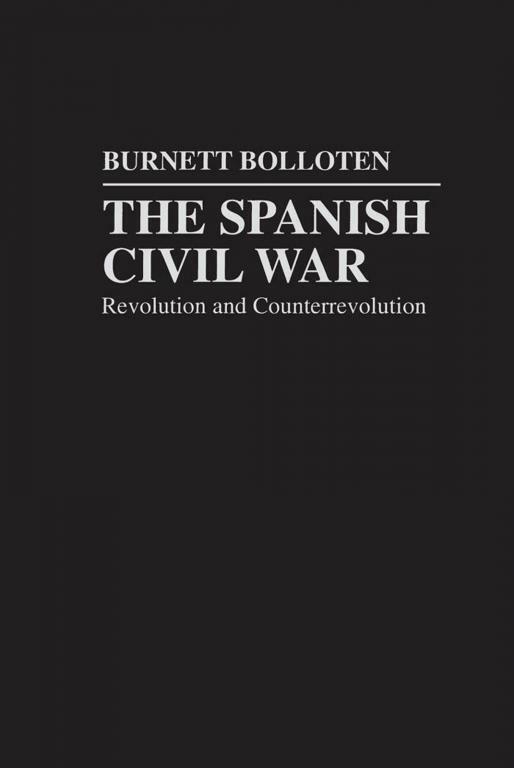 Completed by Burnett Bolloten just before his death in 1987, "The Spanish Civil War" is the culmination of fifty years of dedicated and painstaking research. While Bolloten's earlier works -- "The Grand Camouflage" (1961) and "The Spanish Revolution" (1979) -- ended with the controversial events in May 1937, "The Spanish Civil War" covers the entire period from 1936 to 1939 and is the most exhaustive study on the subject in any language. It will be regarded as the authoritative political history of the war and an indispensable encyclopedic guide to Republican affairs during the Spanish conflict. Using extensive documentation from a vast collection of primary sources that he accumulated over the years, Bolloten develops two general themes. First, he meticulously charts the depth and scope of the popular revolution unleashed by the July 1936 military rebellion, showing that -- despite elaborate attempts by some Republican groups to minimize its significance -- the revolution dramatically reshaped the architecture of politics in the Republican zone. Revolutionary committees sprang up in countless villages and towns, creating new structures of economic and political power, largely controlled and directed by workers' organizations. Second, Bolloten argues that the fierce struggle for political hegemony on the left led to the rise in power and influence of the Spanish Communist party. He documents precisely how the Communists managed either to eliminate or absorb their opponents on the left, including Anarchosyndicalists, dissident Marxists, Socialists, and liberal Republicans. Backed by the prestige and material resources of the Soviet Union, the Communists gained decisive control over nearly every phase of public life. Underpinning Bolloten's analysis of the Communists' rise to prominence is his carefully researched discussion of international diplomacy during this period. I really do encourage anyone with an interest in the Spanish Revolution to read this book. It's totally solid in terms of the information on the revolutionary achievements in 1936, though Bolloten levels certain liberal criticism at the revolutionaries for violence against landlords and agrarian petty bourgeois types. The book's greatest strength is how clearly it captures the political dynamics within the Republic and specifically the PCE's murderous realpolitik--interestingly, the PCE's virtual takeover of the Republic is framed as sort of a dry run (in practice but not intended as such) for the methods used by the CPs in the Eastern Bloc after WWII. Bolloten also spends a great deal of time time untangling the interests of the various European powers in the Spanish Civil War. Top notch account of the period and left me with an even lower opinion of the Spanish Stalinists.